Brian was in the States on Shabbat (Saturday), so we planned ahead to hold our home-centered church on Sunday instead. He walked in the door late morning and we were out the door early afternoon for a day in Nazareth. We have LOVED learning about the New Testament this year and have tried our very best to find places that correlate to the lesson being taught. 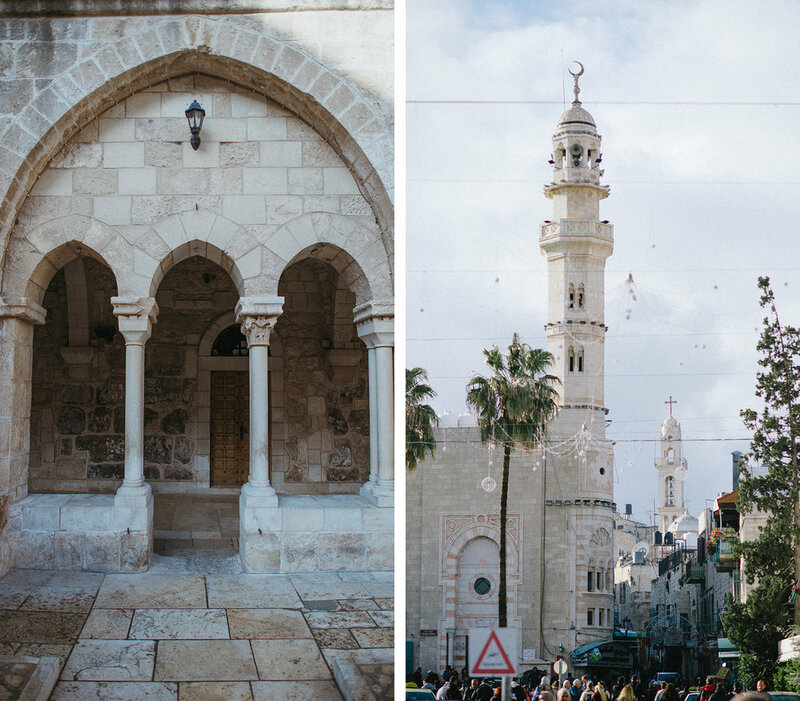 Luke 2 and Matthew 2 landed us in Nazareth on a chilly day. Winter has lasted about a month and our now thin-skinned bodies don’t wear this weather very well. Happy to report that we are back to 80 degree days! We began our day by climbing Mt. Precipice. As recorded in Luke 4, this is where Christ escaped from his fellow Jewish worshippers when they attempted to throw him off. He was able to miraculously escape. While the west side of the hill faces the old city of Nazareth, the east side has incredible views of the Jezreel Valley, Afula and Mt. Tabor (and on a clear day, the Sea of Galilee). The view was so pretty and the cliffs…slightly scary. We found a place off the path leading up the mountain to hold our family church. 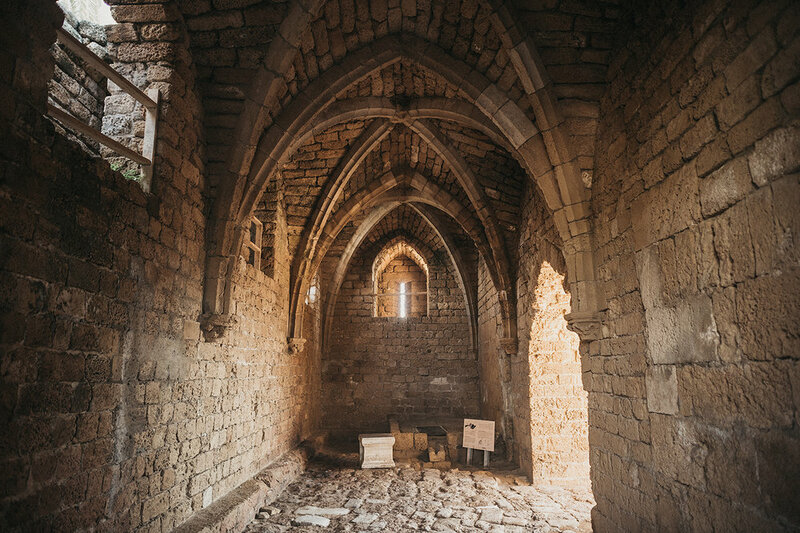 Brian loves to find a peaceful setting, one that may look similar to what Jesus may have seen 2,000 years ago, and this one fit the bill perfectly. We cannot say enough how much this new church structure has been a massive blessing for us. I’ve loved learning intently about Christ’s life as I study on my own and then learning it again and even better when we all talk together about it. And I really love that we can talk about the birth of Christ, point to where it happened, and then go and visit it. 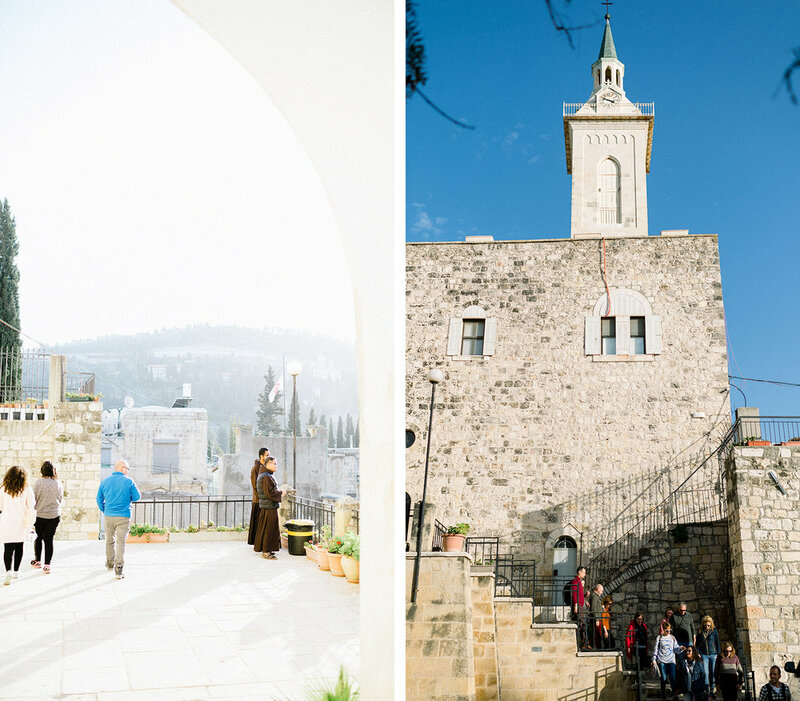 Picture above and right is the old city of Nazareth. After we left Mt. Precipice, we went to the domed Basilica of the Annunciation, where it is believed the angel Gabriel told Mary she would bear the Son of God. Below, this beautiful depiction is of Christ, as a child, with Mary and Joseph. It is right between the Basilica and St. Joseph’s church, said to be the site of Joseph’s carpentry shop. 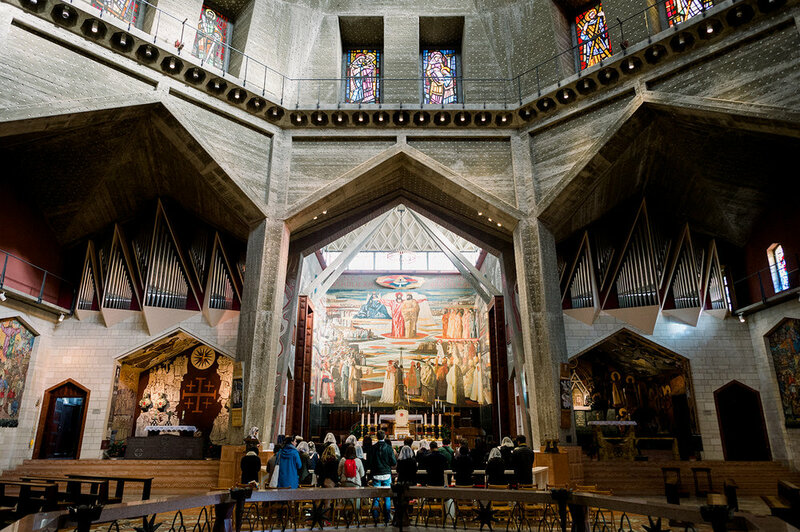 The interior of the Basilica is really unique and modern. 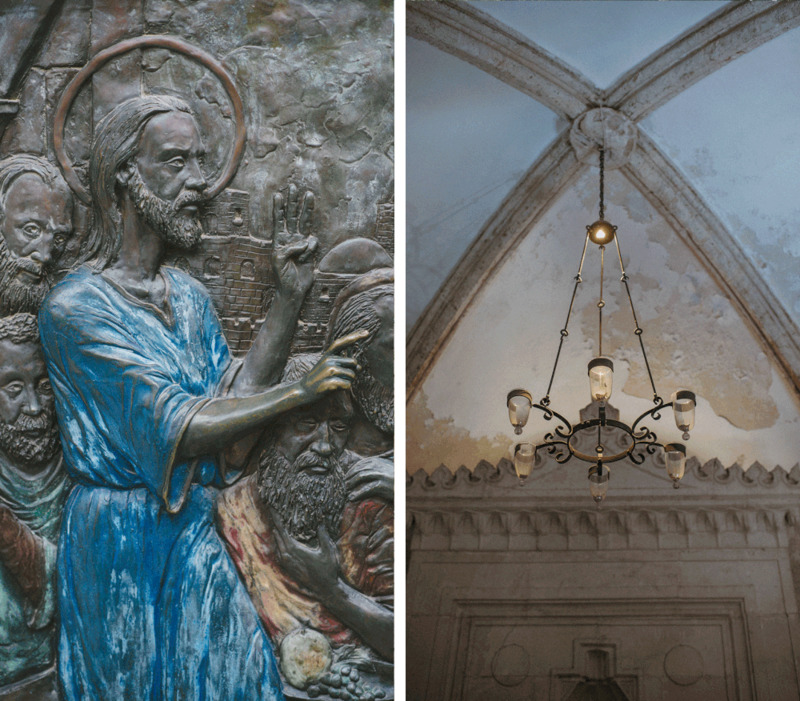 The walls are adorned with massive artwork from countries all over the world that detail their interpretation of the mother of Jesus. The organ, below, as well as the interior dome were so stunning. Our last stop in Nazareth was Mary’s Well, where the Catholic church asserts that Mary was actually visited by Gabriel. Chasing these pigeons by the well might have been the highlight of the day for the kids. Our sweet Lauren (also known as “Little Lady” in our home) turned 10 on January 5. Brian was out of town for her birthday, so we delayed celebrating until he came back. She really loves gymnastics these days and was set on going to a trampoline park with the family, so we found this place just south of us. It was on a Monday, so the place was almost empty and had all of the bells and whistles any kid would enjoy- zip lines, rock climbing, raised obstacle courses, trampolines and foam pits. Our kids had the BEST time running around and playing and have begged to go back every day since. Lauren lives for gymnastics. She got this cute leotard for Christmas and was so excited to wear it to the park. She’s been intensely working on her handstand lately. We love this little lady with our entire hearts and are so so so sad about her entering the world of double-digits. But equally happy we got to celebrate what a great girl she is, in a place as fun as this. It is going to be hard for me to do justice to this day. Anything I write will fall short of the actual events and the way they felt. It was one of those times when you feel so deeply and so much. 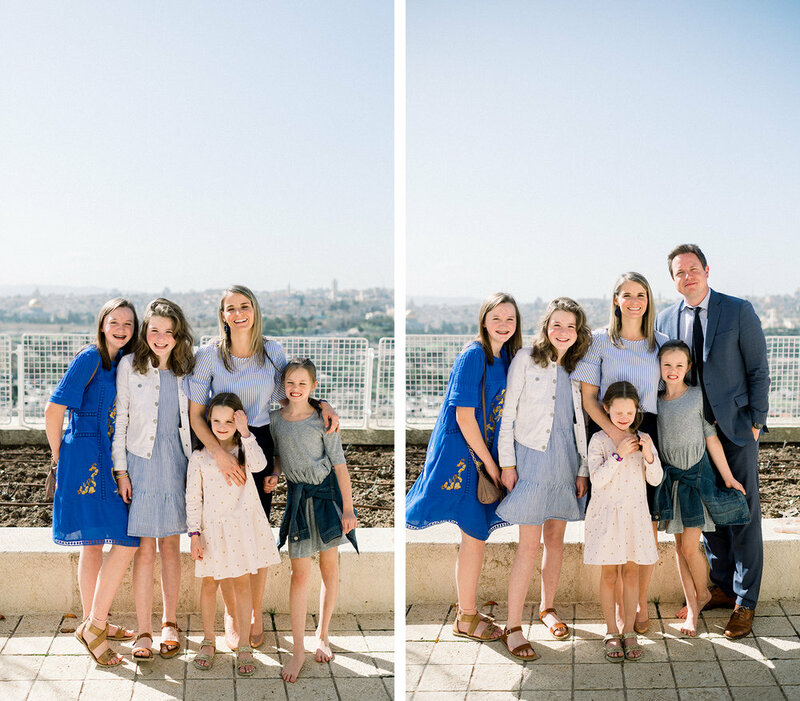 We decided to go to the Jerusalem branch instead of our own in Tel Aviv because we wanted to have more time to show our kids some of our favorite sites. We also wanted to take advantage of living so close to this sacred place and hold our “family church” (“Come Follow Me” LDS program) in a spot that had scriptural significance because we are studying the New Testament. After attending two-hour church (hooray!!) 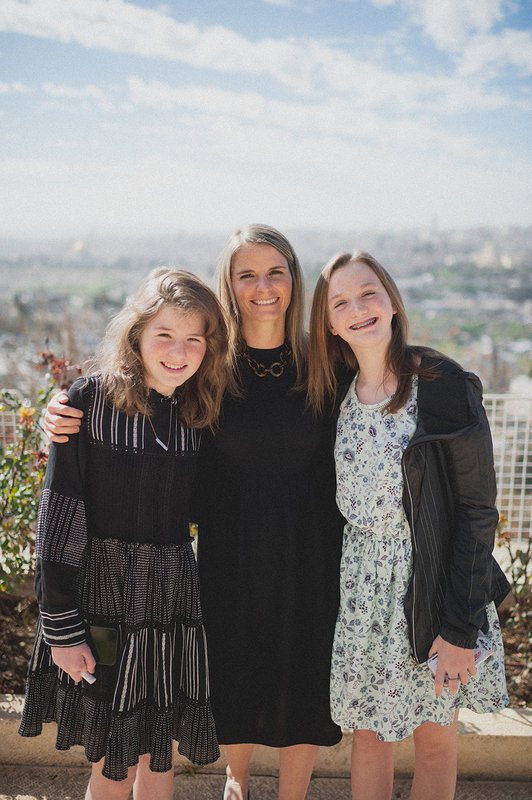 at the BYU Jerusalem Center, one of our favorite places on earth, we wandered out to their front garden that overlooks the entire Old City with is ancient walls and many famous landmarks. I don’t know if there is a better view. My heart might burst sometimes with gratitude that we get to be here right now with our kids. And to see them experience all of it is more than I could ever hope for. What’s better than sitting in church and overlooking this place and knowing you’re just next door to the Garden of Gethsemane while worshipping? Nothing. 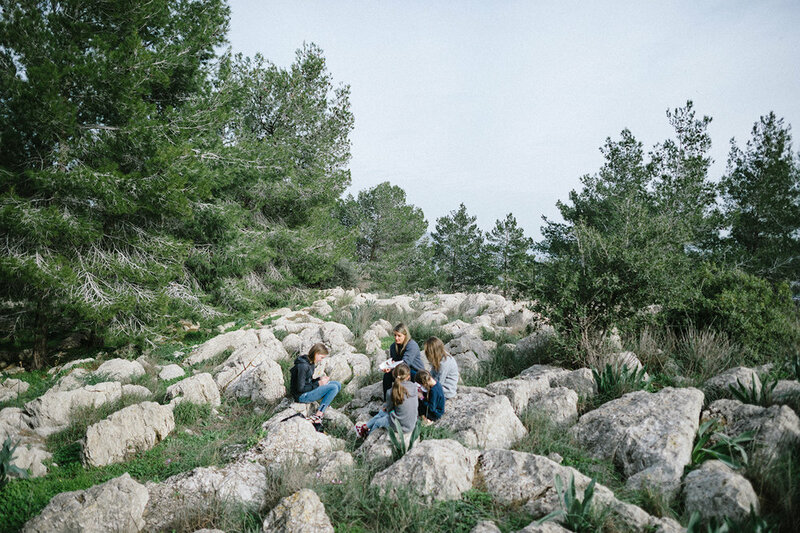 After church, we drove to the Garden of Gethsemane and walked through it for the first time with our kids (every time we have come here in the past its been closed or we haven’t had the chance to get to it). It was pretty awesome to explain what happened here and see the recognition in their faces that the scripture stories they’ve read and heard so many times in fact happened, and happened right where they were standing. 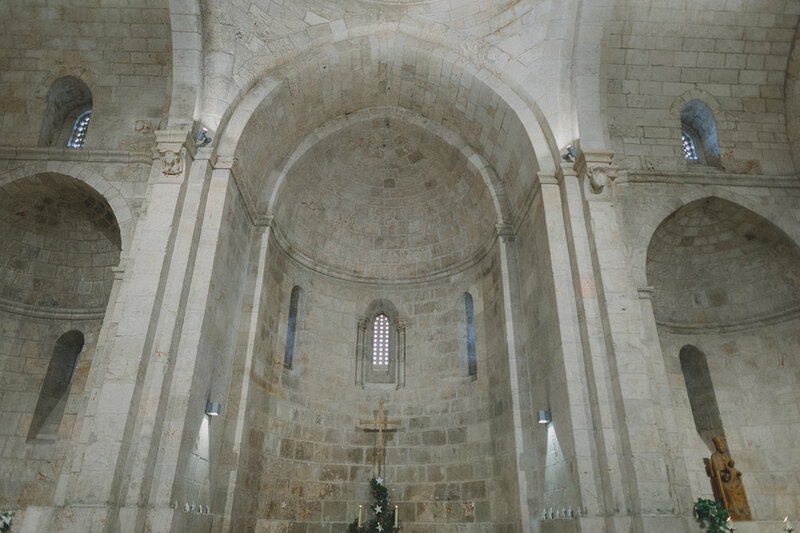 They saw the ancient trees (some of which were actually alive 2,000 years ago) and went inside the church to view the rock that is traditionally believed to be the rock that Christ had his Intercessory Prayer for each of us. Its a different conversation with your kids about the scriptures when you’re actually seeing where these things take place. They had lots of great questions and definitely a recognition that this is all very real and true. It was extremely special to be there with them in this moment. After that, we walked across the street to the Gethsemane Cave and were able to look inside (the screen was locked, but the door was open so you could see) where Christ often sat with his disciples and close to where Judas betrayed Him. They had regularly gathered here, so when Judas betrayed Jesus and was asked to show the guards where He was, it wasn’t hard to find him. 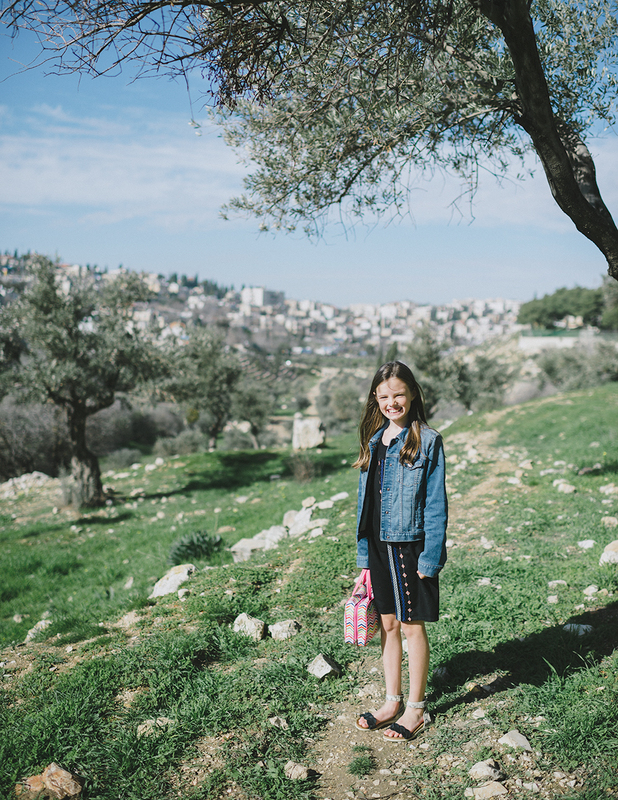 From there, we walked up the hill to the garden across from the traditional site of Gethsemane, which probably looks almost exactly like it may have those 2,000 years ago. 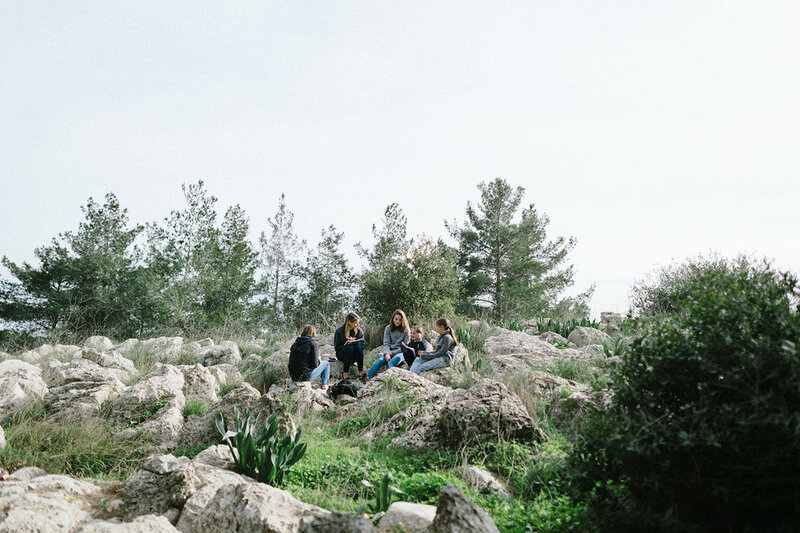 After telling our kids about Orson Hyde (the park dedicated to him was just above us here) and why his mission in 1841 to Israel was important, we decided to find a quiet spot right here to hold our family meeting. 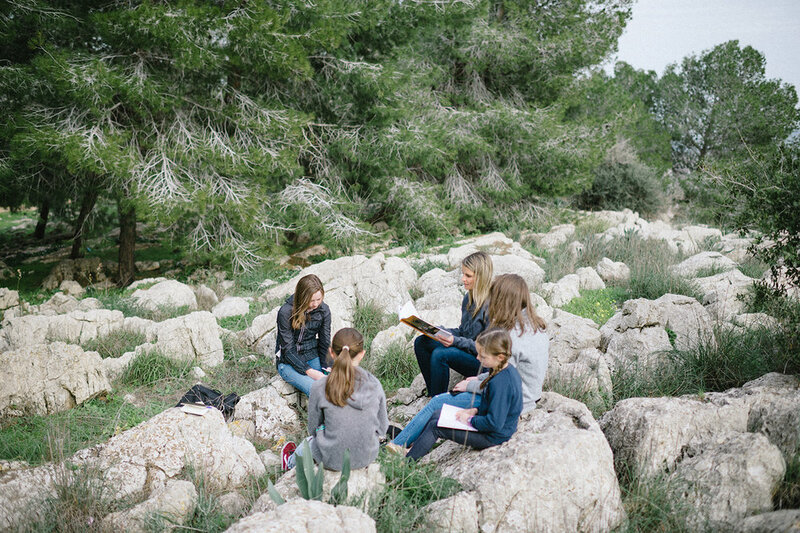 We gathered our scriptures and journals and sat overlooking the Old City while we reverently began talking about the story of Mary, Joseph, Elisabeth and Zacharias. As we talked about our own experiences and lessons of how God can help us accomplish anything, even the impossible, a spirit of love and faith was felt so strong. We shared with each other for a long time and felt our testimonies strengthened that the Savior is real and He knows us and loves us and stands waiting to help us whenever it is needed. I cannot say enough that we completely recognize how special this moment was and how grateful we are to be here and experiencing it with our kids. We know that we have been blessed immensely to be able to do this and we hope we can take as much advantage as possible before our time here ends. It was one of those moments that I don’t think any of us will ever forget. 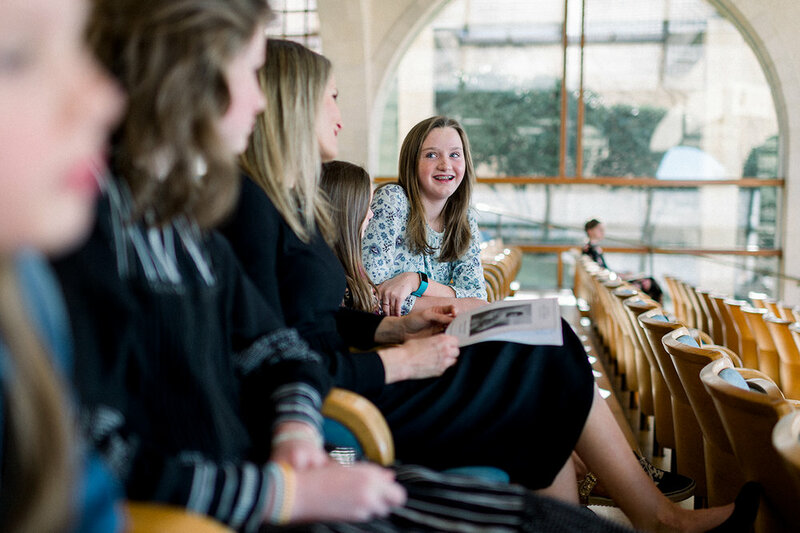 And, I do know this…today the scriptures came alive for our girls. 9 And immediately the man was made whole, and took up his bed, and walked. This site is gorgeous and feels so much more untouched than most in Jerusalem. St. Anne’s Church is famous for their acoustics and because it was relatively empty on this day, I asked my girls if they’d want to sing a song together after we walked the pools. Lauren chose “I’m Trying to Be Like Jesus”, which was perfect for the occasion. We walked inside and sat on the front bench together while we gathered our courage- all of us are pretty shy- so this was a stretch. What started out quietly, was soon picked up by the incredible acoustics and made to sound much louder and more in tune than we could have hoped! Knowing a magical memory was being made, we sang louder the powerful words “Love one another as Jesus loves you. Try to show kindness in all that you do. Be gentle and loving in deed and in thought, for these are the things Jesus taught." 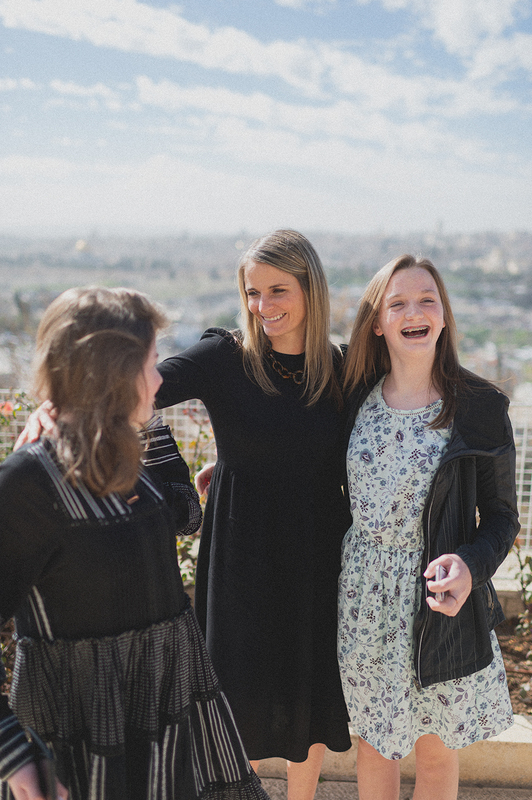 and my heart almost burst again with how much I love my girls, this city, this memory and above all, the love that Christ has for each of his children. Brian was taking pictures and didn’t know we were going inside to sing. He walked in at the chorus and recognized our voices and the song and began filming immediately. I hadn’t planned on recording us and he didn’t know what we were doing, but I am so glad he caught this! I’ve watched it hundreds of times already remembering how it felt. One of the best moments ever. Right there, right then was something I never hope to forget. I cannot describe it…it was mostly felt. Our group gathered here at the main entrance to the shuk. From people-watching to live, local musicians playing at all hours of the day, you are never short of entertainment at this spot. Our first stop was at a raw juice bar where we tested some homemade concoctions that were lively, interesting and…mostly delicious. Then, the store purveyor opened the good stuff…what we now call booger lotion. Haha. It is this crazy stuff that he had us rub in our noses and POW! all of the sudden, you could breathe better. The guy was super entertaining, especially when he couldn’t keep his hands off of Jim! 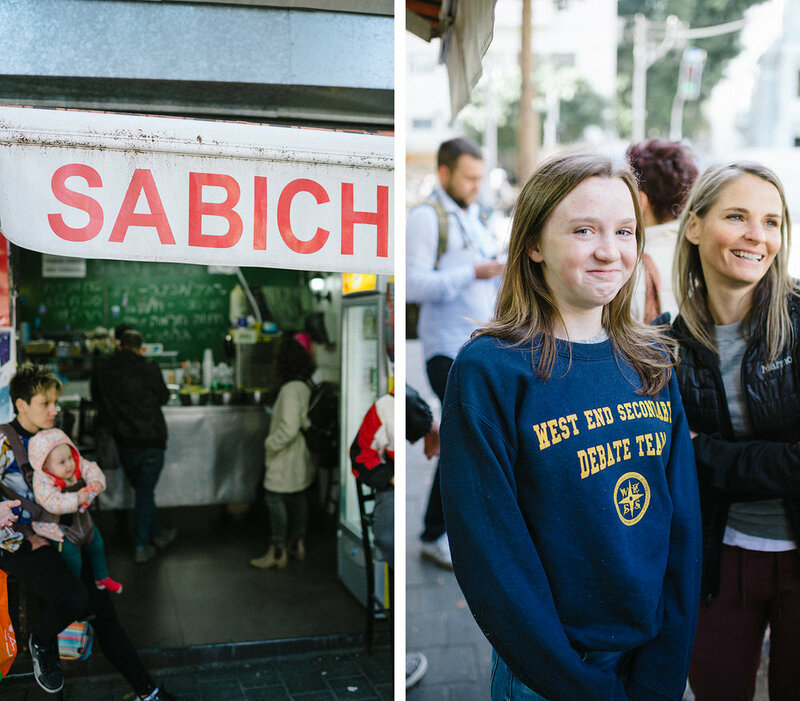 From there, we wandered across the street to the self-proclaimed “only authentic Israeli food”, Sabich (pronounced sa-beek). Israel doesn’t have an original cuisine- its a new country full of many cultures and immigrants, literally from all over the world. 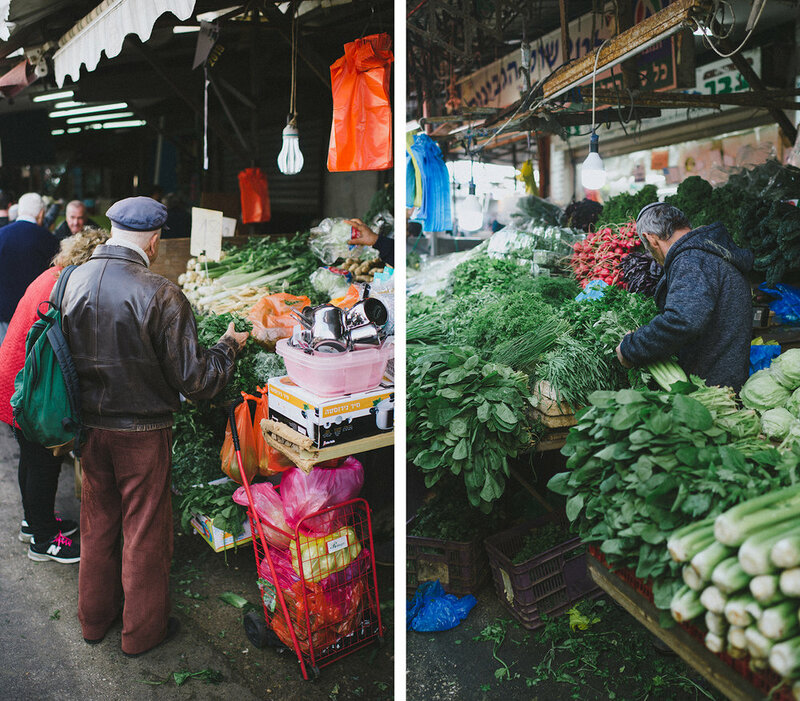 They each bring their own food to the table, figuratively speaking, so Israeli food is a mash-up of all of that. Sabich, however, claims to be their ace. It came about when a bus driver, named Sabich, pulled out his lunch of last night’s leftovers stuffed into a pita and the sandwich was born. It has too many vegetables to name (and to count!) as well as a hard egg all thrown in with some sauce and its actually delicious- the line out the door at all hours would affirm that. We tried some interesting Arab spices at this stall. Jenn and Jim didn’t love them, but we may have acquired a taste for a handful of new things here that heavily use this stuff so we partook and even enjoyed. We also snuck into a place that serves Turkish Sephardic malabi, a sweet mixture of sugar, dairy, cornstarch and rose water topped with crushed nuts and coconut. It was subtle and so good! This place though…oh my goodness. It was hummus redefined in every magical way it can be. Truth be told, up to this point, we haven’t varied off the traditional hummus path because we didn’t even know another path existed. And now I cannot look at hummus the same way ever again. To begin with, they only serve hummus, which, turns out, can be eaten and is eaten for a main meal all of the time in Israel! This guy (who inherited this cafe from his father) served us shakshuka hummus, Balkan hummus and, the piece de resistance, Mexican hummus. I cannot even…it was so good. Want to know a hummus secret? If you cut up a yellow onion and dip it into hummus, it completely takes away the bitter taste of the onion. We learned that here. Yum. We were all blown away…and as you can tell, I get passionate about good food. Next stop was at the cutest old lady’s house that serves toasty (ie fried) homemade Armenian bread stuffed with egg and cheese and topped with a salsa. We were all stuffed at this point, but it was so good. And, she basically threw us a dance party for the 10 minutes we were there. It was so funny. This cute girl was our tour guide and she did such an awesome job showing us around the market. Tour was Delicious Israel, if you want to check it out. We wandered down the main thoroughfare while indulging in strawberries, which luckily for us, are a winter fruit here. They are so delicious. Really, all of the produce here is amazingly fresh since most of it is grown right here in Israel (mostly due to being surrounded by countries who don’t necessarily get along with you). You can get a few things from Europe, but they are so outrageously priced ($12 for a small clam of raspberries…no thanks!) so we stick to the local fare. My oldest sister, Jen, and her husband, Jim came to visit us all the way from Arizona right after Christmas. 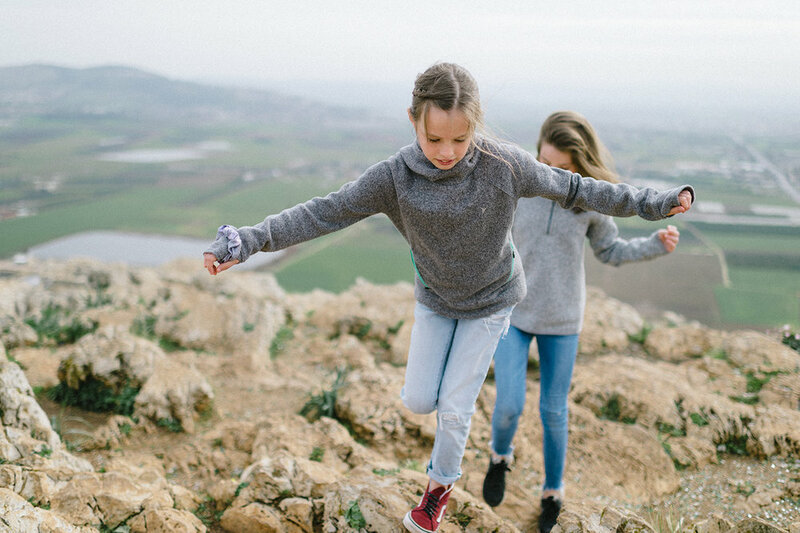 Neither of them had ever been to Israel before, so we were really looking forward to getting out and exploring with them. As hard as we have wanted to get out with the six of us, we haven’t done as much as we wish for a lot of different reasons (most of which have been outside of our control). However, we hired a tour guide for the two days we had planned for Jerusalem while the Taskers were here and it ended up being really awesome. Aladdin, an Israeli Muslim, was our guide for those days and he drove us all over the area and was able to give us tons of great information. He even answered most of our questions about all things cultural, political, geographical and historical. He was great. The Taskers were delayed for a full day in San Francisco on their way here, so we only had them for 5 days. But, we made the most of it by stuffing as much in as we could. They were such good sports, especially given all of the jet lag you deal with in a 9 hour time change. We walked around Orson Hyde Park and the Garden of Gethsemane on one of our only sunny days during their visit. The winter weather here is slightly erratic, but this has been an extremely wet and windy one and Jenn and Jim experienced that for sure. 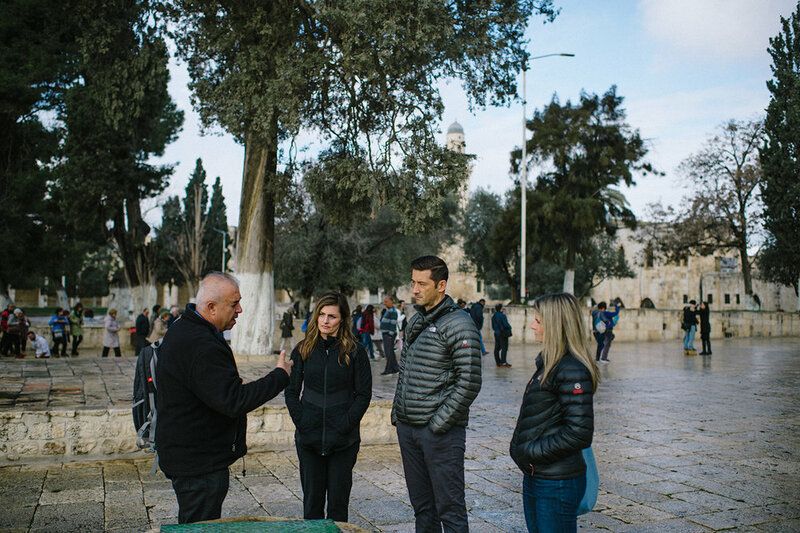 It was also pretty cold in Jerusalem while we visited, so you’ll see us packing on the jackets and layers to stay warm! We visited the Garden of Gethsemane and the Mt. of Olives, the Last Supper Room as well as the house of Caiaphas. But my favorite part was seeing Bethlehem for the first time. Bethlehem is in Palestine, where a good portion of its inhabitants are Christian. Crossing the border and seeing the massive wall that separates Israel from Palestine was pretty incredible. The graffiti alone spoke of so much political strife and the Palestinian desire to be understood. I could go on and on about how I feel about the situation. We saw the Christmas trees and decorations all over there that we missed so badly in Tel Aviv over the holidays. 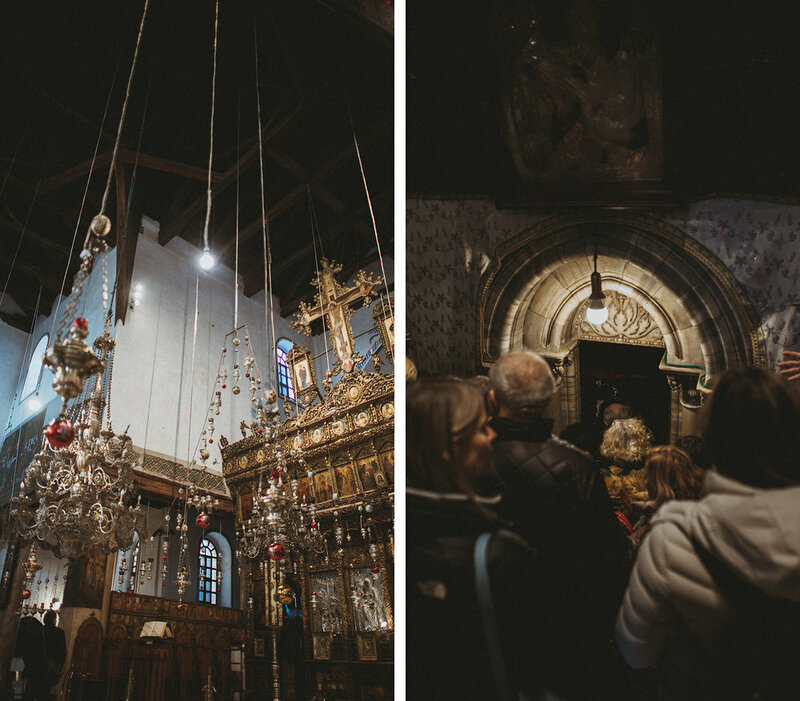 We made our way to the Church of the Nativity, where the traditional site of Christ’s birth is enshrined. I loved the old church and the feeling there. It felt like a genuine sight and we were able to get right in and down the small stairs that led to the cave below the church where they believe Christ was born. My entire life I thought He was born in a traditional wood stable, but that is not the case. This is inside the Church of the Nativity and I really loved the old mosaics, woodwork and colors. Down the steps into the cave, as shown above. Aladdin pulled a few tricks and got permission to slide us right to the front of the long line (I’m going to call it “perks of paying for a tour guide”??). It was a quiet, serene place despite the amount of people down there. Everyone seemed to understand the need for it. I love this Christmas story that we get to celebrate. This is a wood working store in Bethlehem, but we went later that night to Jimmys Bazaar in Jerusalem. It was bazaar (no pun intended) to see all of the LDS carvings from the Book of Mormon there, as well as some Jimmer Fredettes to throw in the mix. BYU cougar enshrined in wood? Why not. You can get it at Jimmy’s. We left with a couple of things that we really loved and will help to remind us of our time here in Israel. 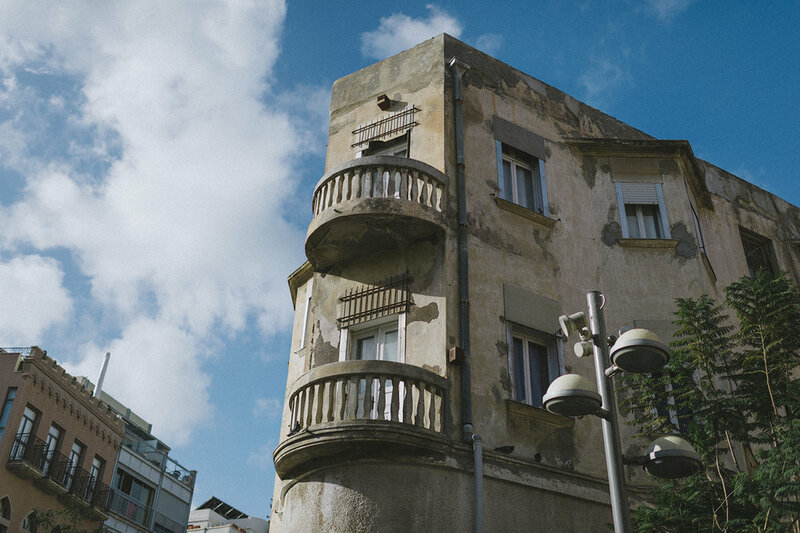 We spent a full day in Tel Aviv one day, letting everyone sleep in and then walking over to Jaffa’s Old City to grab something to eat and poke around their cool shops. I love Jaffa. On day two of our tour of Jerusalem- again with Aladdin as our guide, we saw a TON. 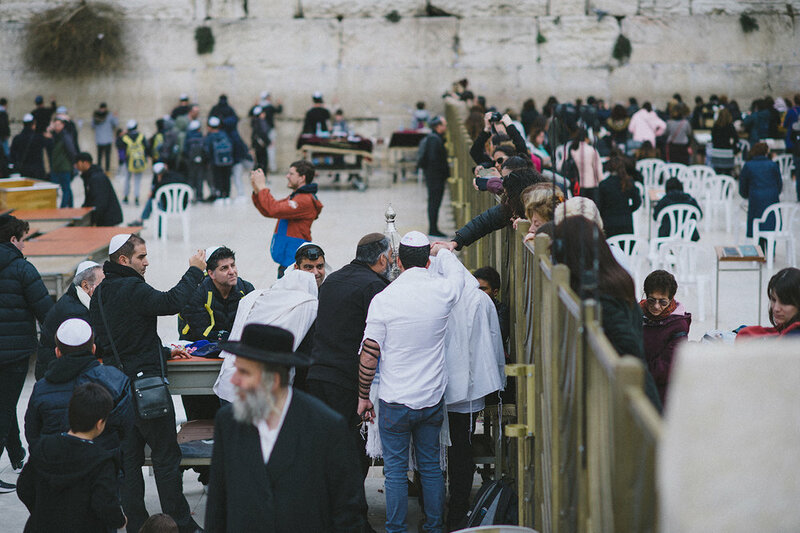 I loved this day because, while we have spent a fair amount of time here, we haven’t really done many of the sights other than the market and Western Wall. We met Aladdin early so that we could get into the Dome of the Rock in the morning before it closes for Prayer. 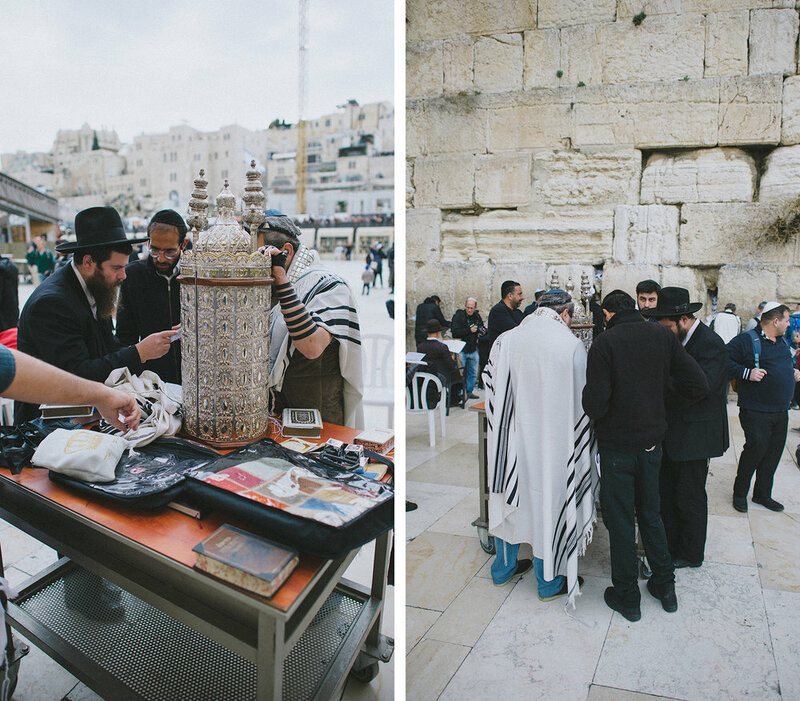 It sits right above the Western Wall, so as you’re walking into it, you look over at the worshippers here, many of which were celebrating Bat and Bar Mitzvahs on their traditional Tuesdays. So fascinating for me. Inside the Dome of the Rock was pretty awesome. The views of the Mt. of Olives as well as parts of the old city were so nice. But the actual shrine, as it sits on Temple Mount, with its gold dome and commanding presence is amazing, especially given the history of the sight and it being the epicenter of so much angst and conflict between Muslims and Jews. Here is our guide, Aladdin, no doubt telling us something totally engrossing about the history here. Its hard to wrap your head around how long and by how many this land has been controlled over the last few thousand years. Even the more recent conflict is fascinating. The mosaics on the shrine are stunning. Muslims don’t ever depict people, or really any living things, because they believe they are created by God and we could never do it justice with our natural human shortcomings. 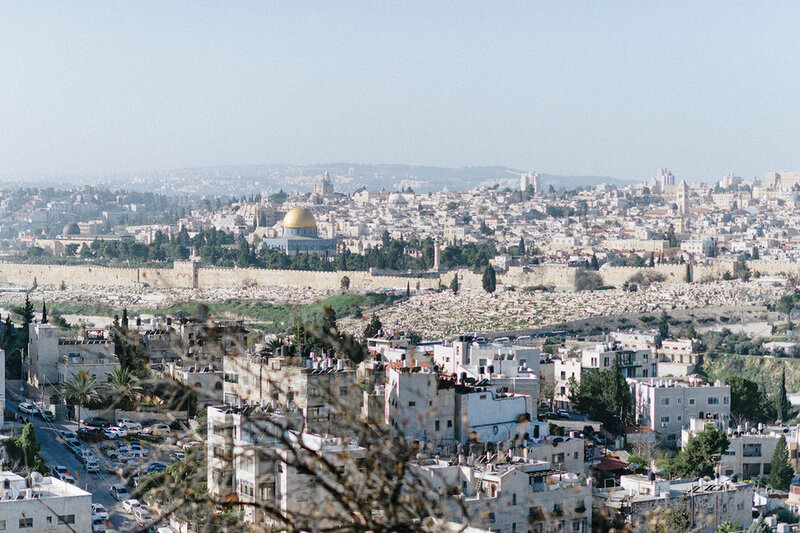 From the Dome of the Rock, we began to walk along the Via Dolorosa, exploring the churches at the various stations of the cross as we went. These pictures are slightly out of order, so I’ll try to give context as I go along. After lunch (pita sandwiches that we ate on the steps of Damascus Gate….yum! 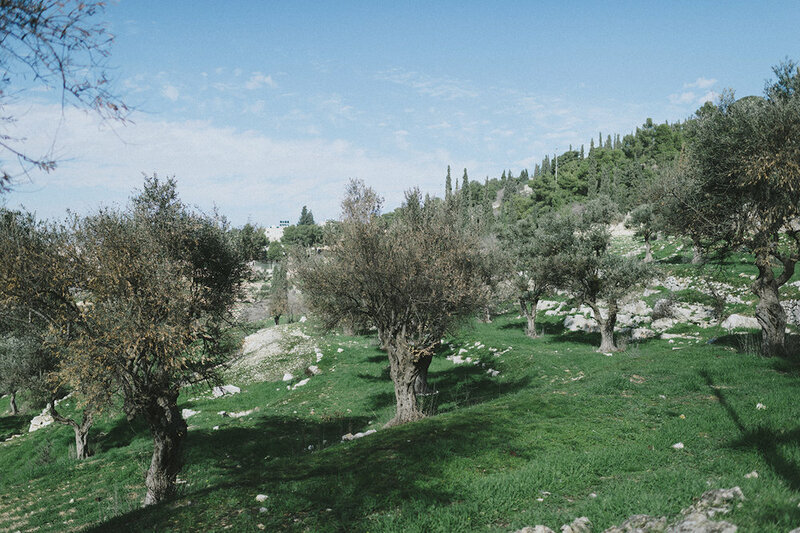 ), we ventured over to the Sacred Grove, where many people believe is Golgotha, or Calvary, as well as the tomb where Christ may have been buried after His death. 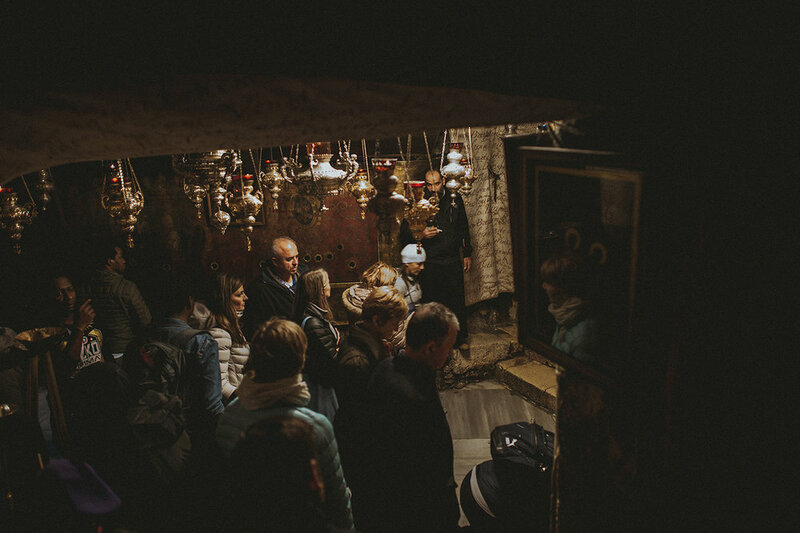 It is extremely peaceful at this particular sight, versus the Church of the Holy Sepulchre, where the majority believe the death and burial took place. St. Anne’s Church is near the pools of Bethesda and we saw this for the first time today. We fell in love with this place right off. Its quiet, tucked away almost, but so well preserved. It felt truly sacred in a place where most significant sights are covered in ornamentation. We spent a bit of time walking around here, as well as this gorgeous church with its famous acoustics. We walked through the market of the Old City and even tried several Palestinian delicacies, such as kanafeh and their yellow bread with dates. Definitely different from American desserts, but I’m glad we got to try it all. We got to see the Western Wall up close and made sure Jenn was able to touch it. This place is just unreal. We made a stop at the Church of The Holy Sepulchre while walking Jerusalem as well. We ventured into this shop right across from it too. 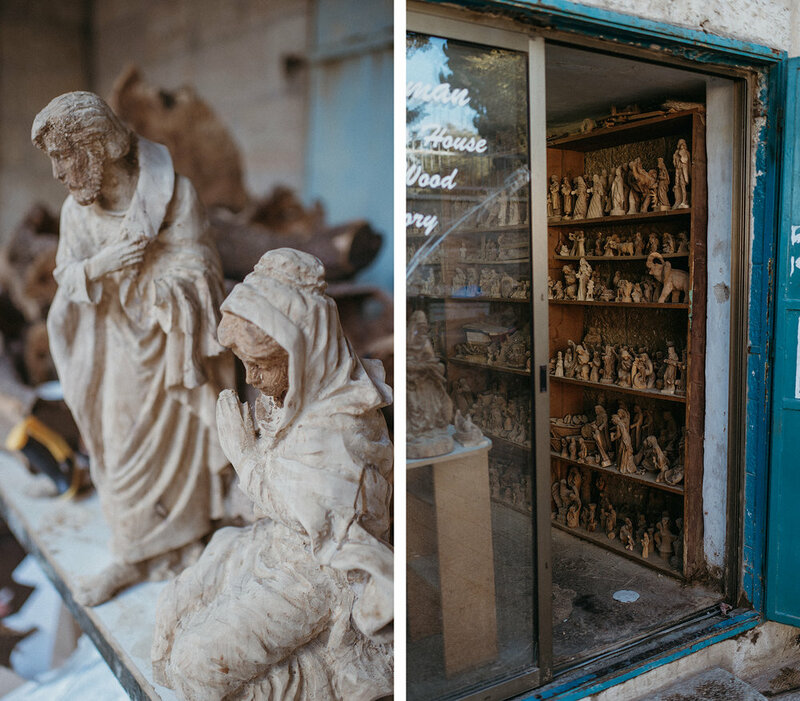 Its an antiquities shop owned by a man named Yasser Barakat, a Muslim, and he’s been in business from the moment his father gave this same shop to him. Everything around here seems to be passed down from generation to generation and this one was no different. I love that. He was the nicest man and as we walked around his shop, we noticed familiar pictures of prominent members of our church on his walls and quickly realized that this was someone who had met and knew many members of the LDS church. Yasser’s daughter (pictured above) even attended BYU…so cool! You know you’re a fan (or a good marketer??) when you put a BYU sticker in your front window in Jerusalem! Ok, this is a cool picture. If you look straight up and on to the hill above, you notice that giant wall, right? Thats the border separating Palestine (Bethlehem, specifically) from Israel. I think this is taken from the house of Caiaphas, where Jesus was imprisoned before His death. These are original steps from the time of Jesus at the Church of St. Peter in Gallicantu. Pretty awesome they are still there, although people are no longer allowed to walk on them. This depiction on the doors of the church show the prophecy of Peter denying Christ three times. Church of St. John the Baptist enshrines the traditional site of John the Baptist’s birth. 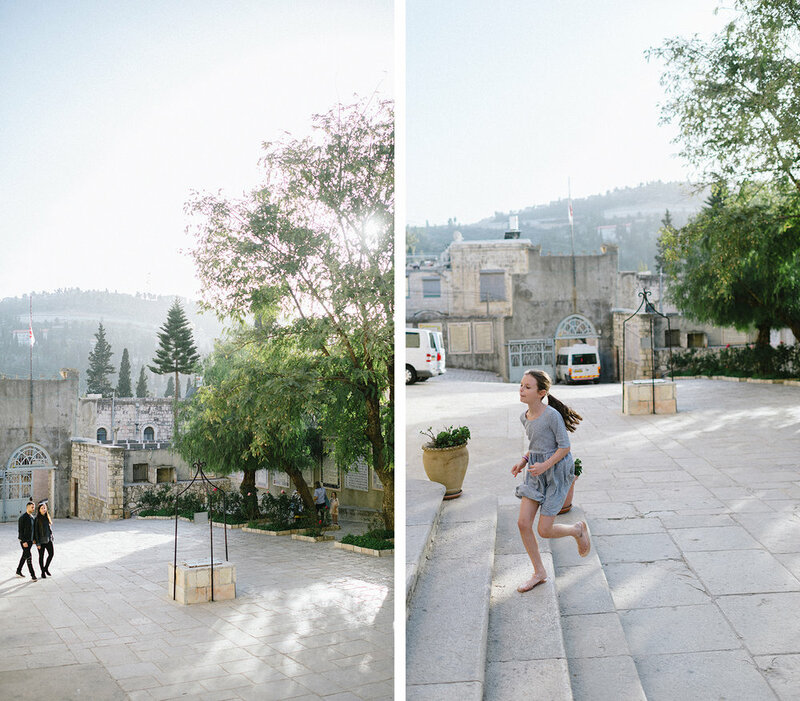 It is located in Ein Kerem, which was the last place we saw on day two as the sun was starting to go down. This city was stunning, especially at sunset. The views from the hilltops were so beautiful. 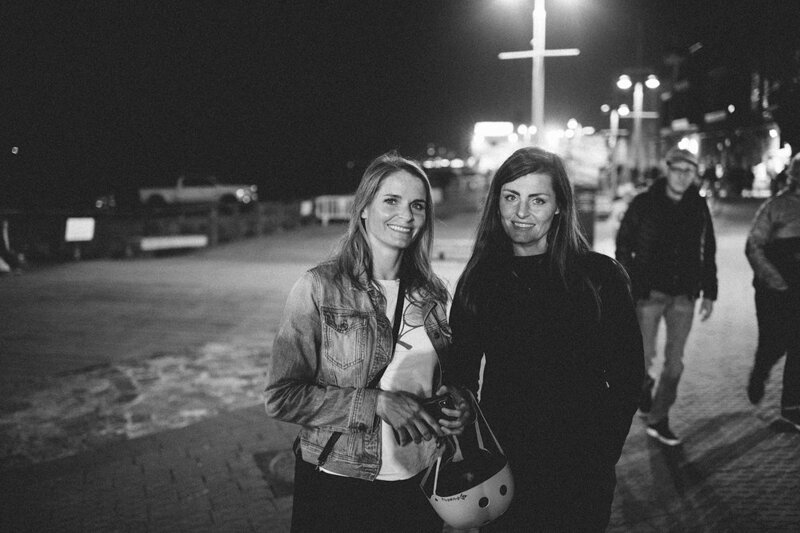 The pictures above are from our night exploring in and around Jaffa. We walked along the oldest port in the world and paid the guy making pitas near the back door at Old Man and the Sea to give us some warm ones right out of the oven. Heaven. That and some gelato made for a well-balanced dinner. 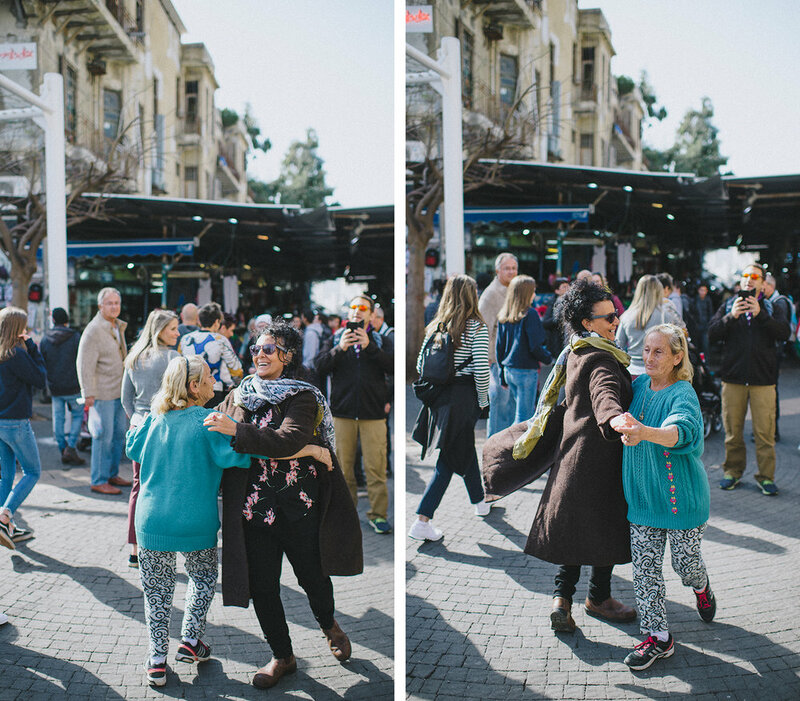 Our next day would be the last with the Taskers here in the Holy Land and we did something I just loved!! Stay tuned. With our girls doing homeschool this year, our schedules are way different than we are used to. They are enrolled in an online program with teachers, tests, and daily due dates. They need to stay on track, but the hours in which they do it are more flexible. However, one of the big downsides is that the schedule itself is relentless. It is tough when you fall behind because you have no choice but to make up your missed work to move forward in the course. They were only given two days off for Christmas and two more for New Years. Which made a quick day trip to Caesarea right before Christmas the perfect idea. 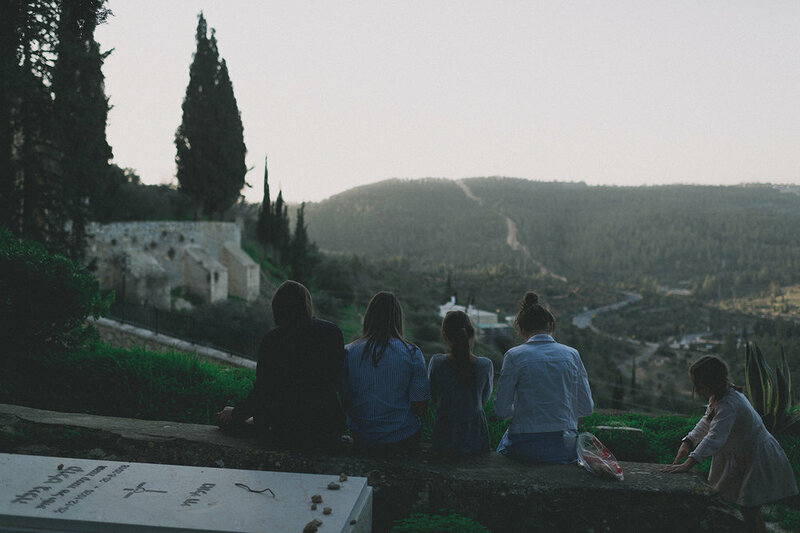 We met up with some church friends in the gorgeous city that lies halfway between Tel Aviv and Haifa (about a 45 minute drive for us). Caesarea began as a Roman city around 20 BC and, since then, has had as many conquests as the different countries, religions and cultures that have inhabited Israel in the last 2500 years…which is a lot. Needless to say, the ruins left today are steeped in history and stories, most of it Roman. The above entrance is right as you come into the National Park and its beautiful! Considering that these ruins are as old as they are and weren’t excavated until the 1950’s and 60’s, they are looking pretty amazing. The ruins also include a hippodrome, theater, old homes and palaces and aqueduct as well as a beach, upmarket harbor shops and dining. After seeing a really well-done video about the history of this place (the only kind of history lesson my kids will happily sit through! ), we ventured out to explore the grounds. We wandered all around the ruins of Caesarea’s homes and palaces, imagining what life must’ve been like all of those years ago. Its incredible to think of how advanced the Romans were! The hippodrome was right off of the beach. The homes closest to both were the nicest and most expensive real estate back when these walls were inhabited. That certainly hasn’t changed in the last 2000-plus years! We held impromptu foot races (perhaps slightly similar to races done back then?!? haha!) from one end to the other but were completely winded at the halfway point- those hippodromes are much bigger than they appear. After hearing our voices lift and echo in the huge theater and then grabbing a delicious lunch in a restaurant right off the water, our last stop was the ancient aqueduct a short drive up the road. Our Christmas festivities began in earnest shortly after our visit to Caesarea. We made and decorated our favorite Christmas sugar cookies. I brought back Christmas sprinkles and large bags of powdered sugar from my trip to the States in early December. You can’t buy either here and they are absolutely essential to delicious Christmas cookies. We made many trips to Carmel Market- one place I definitely wish we could take back with us when we are done here. The kids don’t love coming with me to the market because the smells can be tough, but I don’t have a particularly sensitive nose so it doesn’t bother me much. However, when we were gathering candy to make our gingerbread houses with, they all were absolutely thrilled to come! We made a big stop at the famous gummy vendors there and brought home a huge haul of all sorts of gummies, candy, wafers, and cookies. We should’ve taken a picture of just that! Our gingerbread houses turned out so cute this year. 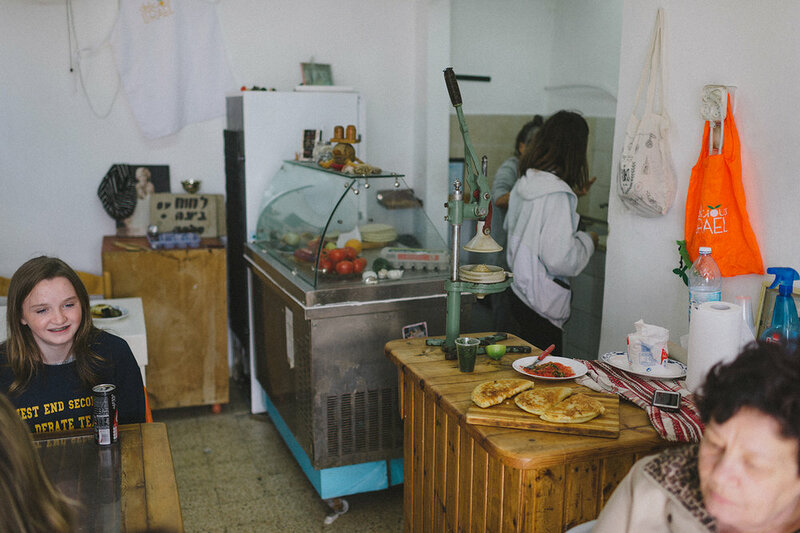 Dad and Tessa paired up on a shuk with a fruit seller, candy, and clothing shop inside. Lauren did Big Ben and the Houses of Parliament and Taylor did a candy shop and house. Kate did a cute little village that didn’t hold up very long because we didn’t have gingerbread, and biscuits just aren’t as sturdy! Under the ruse of Christmas shopping, Tessa and Dad took off for several hours on a scooter ride one afternoon. They took that bad boy (above and behind Tessa) out for a ride all the way to the airport north of Tel Aviv! It puttered and died about a mile from home, but they had the best time just hanging out together. This is the boardwalk that lines the beaches here and its so nice and well-maintained. It feels like almost everyone here either owns an electric bike or scooter, so you need lots of space everywhere to ride around and this is the perfect place. Those scooters are the best way to get from Point A to Point B and so fun to ride! 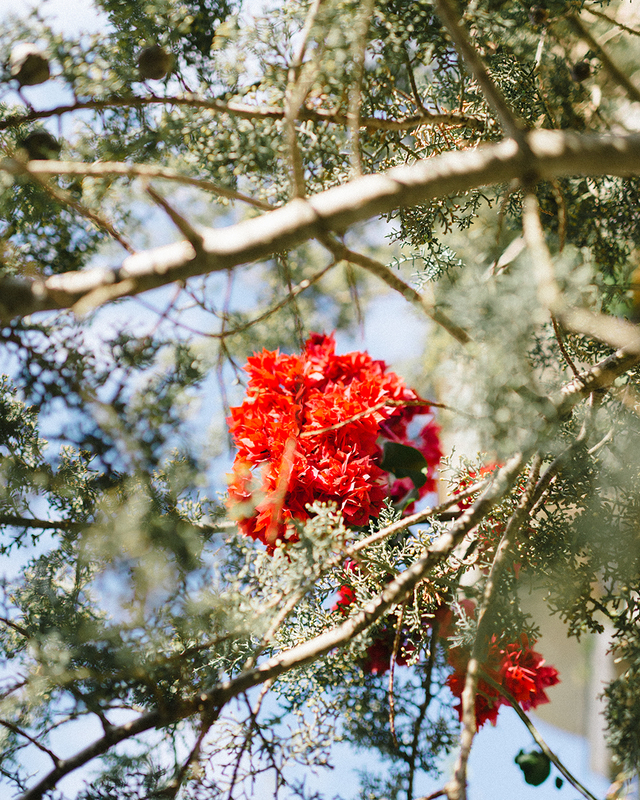 These flowers above are the closest thing you may see to Christmas decorations around Tel Aviv. Its not celebrated at all here and is like any other day of the week! We have an apartment building under construction right next to us and they were working just like every other day. It’s definitely strange, to say the least. Our branch president and his wife are the best! They have lived in Israel for almost 3 years and know all of the ins and outs and give so much to our branch and the people in it. They have a yearly Christmas tradition that they’ve been doing for the last 17 years (and they’ve lived all over the world, literally) of inviting a big group of friends from church to their home on Christmas Eve for dinner, the recitation of the Christmas story and a white elephant exchange. Its so great to have a place to go on this night when you’re not living close to family. You immediately feel bonded to people in a place and situation like this. Tessa and her self-proclaimed best friend (the cutest little girl below) both randomly opened the cutest little gifts with crayons and coloring books- perfect for them. They were so cute and excited about what they got. The rest of the gifts were a mix of really funny and really awesome things that we laughed and “fought” over. The winner went home with some real German pork sausages and cheddar cheese- two items that are hard to find and/or very expensive in stores here. Then, the kids and even the adults dressed up and re-enacted the Christmas story. We read scriptures, sang songs and worshipped in our own way, remembering why we really celebrate this special season. That night, we stayed up way too late with happy anticipation for the next morning. We got our tree this year at Carmel Market and while its not a traditional pine tree (also impossible to find here because, trust me, we tried! ), it was perfect for us and we loved it. Its branches weren’t sturdy enough to hold more than one decoration so it was pretty bare, but it made for a memory of our Christmas in Israel that we won’t soon forget. Take a peek at that lovely wrapping paper, which I also picked up at Target in North Carolina. I got the biggest roll I could find and when I went to put it in my suitcase, it was waaaay too long. Determined to make it work (and knowing I wouldn’t find another option in Israel), I cut it in half with my hotel knife and stuffed it in my bag! Our neighbors in our building here are from Manchester, UK and aren’t around much, but they were here for Christmas. So, we brought them some of our delicious cookies and they gave the girls these Santa hats and some yummy British candies. Christmas morning magic follows wherever you live! These girls weren’t totally convinced that Santa would find us here in Israel, especially since we don’t have a chimney, but he pulled through in the end. We informed them that Santa was told to give us a simple Christmas this year because we ultimately have to bring everything back with us in the same bags we brought here (two checked bags each). So, he got really creative and surprised everyone with a Disney cruise!!! We go at the end of April and could not be more excited about it. The girls also got some cute new swimmers to wear on the cruise as well as a couple of Polaroid cameras to capture their favorite moments from now until then ;) And anytime its warm enough to wear swimsuits outside on Christmas day is a gift in and of itself! Love this sweet girl so much! Her personality keeps us all on our toes. Brian got a full two weeks off of work, which was another gift! Wow, it was so nice to have him around. We also relented and leased a car for our last few months here. Which has already proven to be totally worth it! We love being able to go somewhere at the last minute (although we don’t drive if its within a 30 minute walk because parking here is a nightmare). Most of us got hit with a very severe cold over the break, so we spent a lot of time resting and relaxing. When we weren’t doing that, we were exploring Tel Aviv more and more, which usually lands us back at Carmel (see above and below for evidence). Yom Tov is one of our favorites and we love taking visitors to eat here. Its so nice to sit outside, eat delicious food, bask in the glorious weather, listen to the bustling market and literally pick up and move your chair out of the way when a car happens to drive by. Its life here! Wild. I was able to give a talk in our little branch at Christmastime and because it tells so much of our life and experience with Christmas here, I wanted to include parts of it as well as my testimony so that I can always have it. I’ll paste it below. 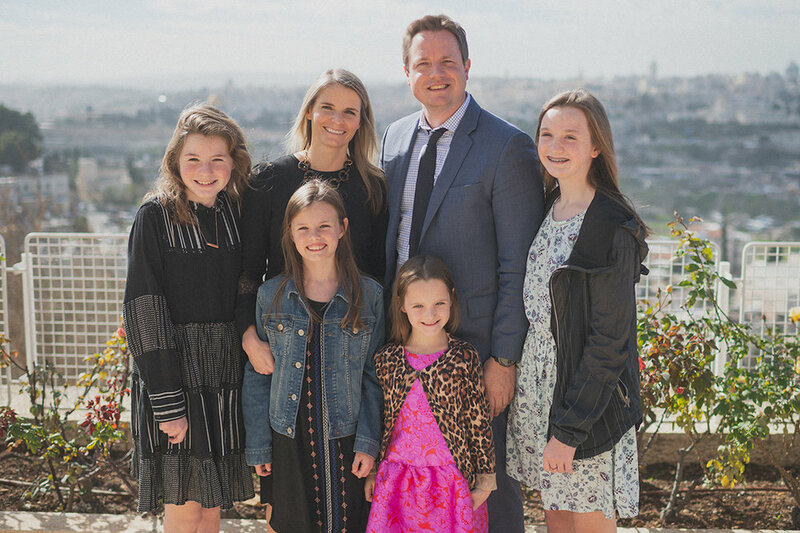 This was our first Christmas as a family living here in the Holy Land. I don’t think anyone of us anticipated what a different feeling there would be in the air during this season as we sought to celebrate the birth of Christ. The traditional decorations of Christmas trees, tinsel, mistletoe, talk of Christ and even Santa, and that united feeling of serving others is much harder to find. However, because of that absence, it caused me to think more deeply than I ever have about the reality of Christ and his birth, not too far from where we all are right now. I have never felt a more profound conviction that Christ was born to be our Savior and to live a life here on Earth that would teach us how to better live our own. I have loved that feeling and the chance to focus on eternal truths more than I ever have before at this time of year. Christmas can mean something different to each one of us in this room, but the simple reality is that it is about Christ’s birth and no life has had a more significant impact on mankind than His. I was able to attend the Jerusalem Center Christmas concert a couple of weeks ago with several other members of our ward. I was struck by the fact that a good portion of the audience members appeared to be Jewish. The most powerful part of the evening for me was when the choir sang “Silent Night” in 12 different languages. A song about the miracle of Christ’s birth in that place in the presence of so many people who may not recognize Him as their Savior and in so many different languages stopped me entirely and filled me with so much love for a perfect man that does not separate us according to borders, languages, religions, or cultures. He only feels pure love for each one of us, no matter what. That is the greatest miracle of all and surely a reason to celebrate. I have asked myself lately what this means for me? How can I take this feeling and apply it to my own life? I can remember Him. I can reach out in service and love to those around me regardless of reasons why we may be different. I can show gratitude for the things I have that are some of the biggest blessings or gifts that I have been given from Him. I know as I seek to honor Him during this time of year, I will feel the Christmas spirit more and more. One of my favorite memories of Christmas as a small child happened when my Dad went out and bought 10 cooked turkeys. There were 11 kids in my family, but we all piled in our big car together and drove around after dark and delivered these turkeys to families in our ward that were in need. We put the turkey on the doorstep, rang the doorbell, jumped in the car and sped away before the person could see who had dropped it off. As a child, I thought it was great fun to hide our identity while we helped others. But, the next week at church, a sweet man came up to my Dad and said that he knew the turkey had come from us and he began to cry. He said that it was an answer to a prayer and that if we had not brought it to him, his family would have nothing to eat that night and they had managed to stretch it to last for a full 5 days of food. It completely changed my feelings, which were already good, to a feeling of knowing that Christ knows who we are and what we are in need of and that He can help us to be angels to each other. We can surely honor Him as we ask, “who is in need and how can I help?” and move forward with courage knowing that He needs each one of us. We all need each other. Instead of making the traditions and decorations the focus of this season, we can make Christ the focus of this season and really, the focus of our lives. We can open our hearts to the sweet whisperings of the Spirit, telling us that we are loved and loved without measure or end. We can also begin to understand that this same love extends to everyone on this earth. I do believe that this is Christ’s most important message. It says “God could have sent His son to live with a wealthy man and a perfect woman but He didn’t. He picked Joseph who was hard working and humble and probably nervous. 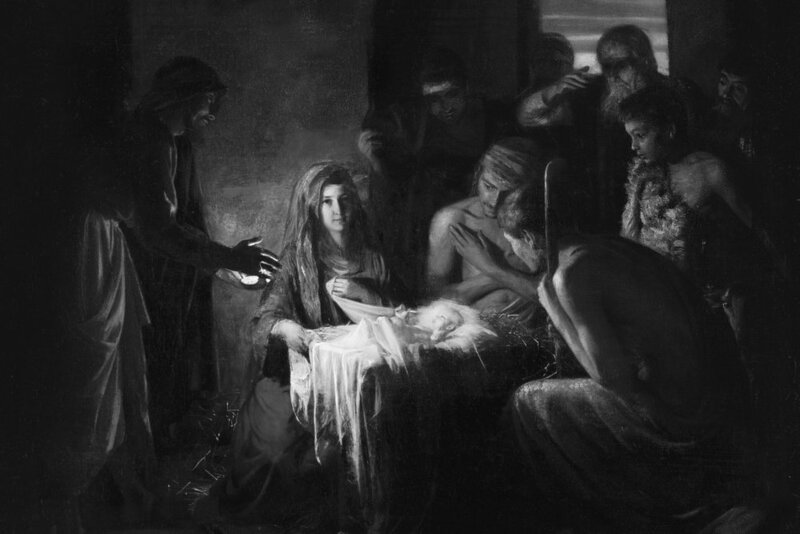 He picked Mary who was simple and imperfect and probably overwhelmed. He picked people with average lives and extraordinary hearts. This gives me hope that what God values is simple and available to every one of us. I want to share my feelings about the one gift that we can give to Him. It is our free will. When we turn this- even our extraordinary hearts as the thought says- over to Him, it is the only thing that we can give Him that is truly ours to give, that doesn’t already belong to Him. I know that He can make more of our lives than we can do on our own. Its not necessarily done in our schedules, but in the depths of our testimony- in our hearts, and in our minds and in the way we treat those around us. He can change all of these things to a higher perspective and to allow us to see the eternal nature of everything we say, do and think. I have a firm testimony of this truth. As we seek to give gifts during Christmas, I hope to be able to commit more fully to turning my will over to Him, knowing that it will grant me much more joy than any worldly gift could give. I love that we know, in our church, that He has come, He lived on this Earth, He died for us, and He was resurrected so that we too could be resurrected one day to live with Him. I love that we know that He will come again to this Earth and bring love and joy to so many who may not have had a fulness of it in this life- all burdens will be lightened by a loving God who knows each of us personally. He loves us, He has always loved us and He will always love us. I know this and I am so grateful to celebrate all of this and the life of His Son during this time and to have the opportunity to focus on what He has done for me and the gifts He has given me that have made my life so much better. I cannot wait for the day when I will stand and see Him again. I say these things in the name of Jesus Christ, Amen. Have you ever been to a place that was so different from anything you’ve seen that you struggled to take it all in? 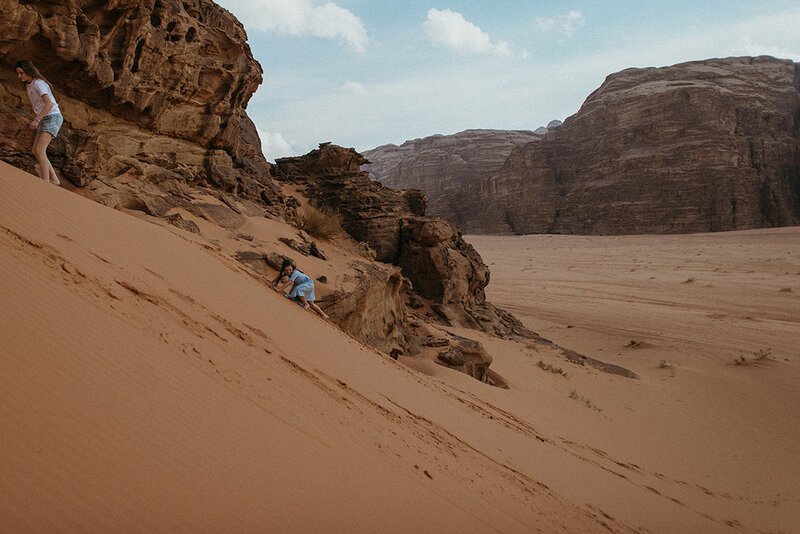 Wadi Rum is that place for us. When I came to Israel to visit Brian on a work trip last December, we stayed here for one night and took a short tour. We knew right away we hadn’t scheduled enough time for this amazing desert wilderness and vowed to return someday. Little did we know that we’d be back with our four girls in tow less than a year later! We were supposed to have our dear friends from NYC, the Rileys, join us, but they had some unexpected news at the last minute and had to cancel their trip. We were SOOOO sad not to have them here because we love them so much. Tessa cried when I told her their girls, Scout and Fern, weren’t coming. But, we are grateful that they found out before they left, which hopefully made it easier on them. We flew down to Eilat early Friday morning (alarms went off at 4 am to make the flight) and then drove to the border of Jordan, about 10 minutes away. After going through customs and entry, we walked across the border and got a taxi into Aqaba, on the Red Sea. We picked up our rental car there and started the hour drive into the Valley of the Moon, a very apt nickname. 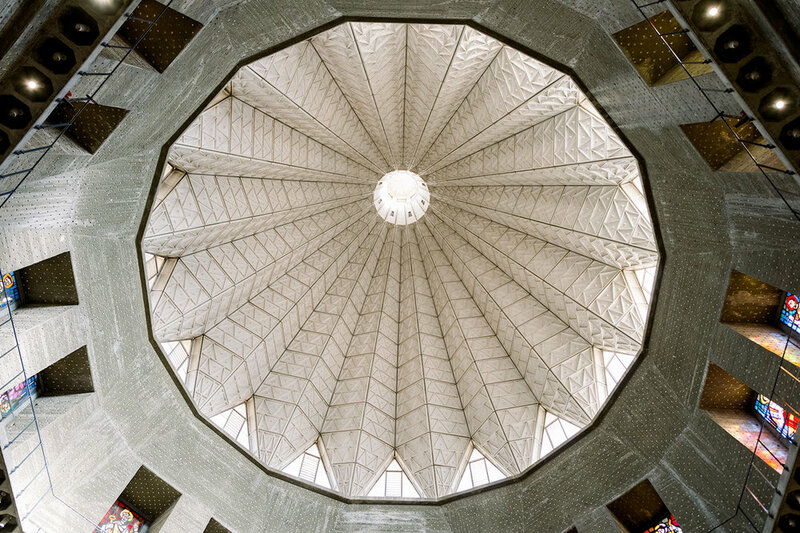 We stayed at Sun City Camp, famous for their space-like, dome-shaped guest rooms. After eating lunch at the camp and dropping our things off, we got back in our car and decided to go for a desert drive with just the six of us. There are no “real” roads, only different variations of tire marks snaking their way through the desert, so we tried as best we could to stick to those. We found some fun dunes to stop at and let the girls run around and jump off the huge hills of orange sand. They didn’t last long in their shoes, as their feet sunk deep into soft sand. So, we got rid of the shoes and just ran around jumping, rolling, climbing and sliding all over the place. Our girls were dying to ride camels again. It was one of their favorite things we did in Morocco a couple of years back. 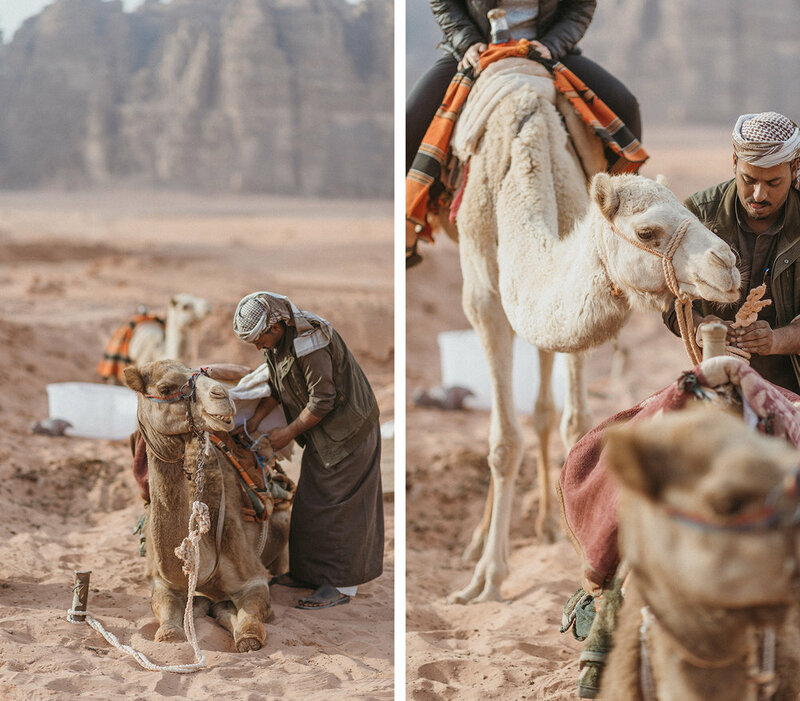 Getting on a camel is kind of like riding a rollercoaster, so if you’ve done it before, you know what’s coming and it makes you laugh in nervous anticipation. Hence, these cute pictures below- lots of squeals and laughter.. You get on the camel’s backs when they’re laying down and then they got on their front two feet first, which quickly propels you forward and then they get on their back two feet, which pushes you right back and upright. It’s awesome. How about that backdrop?!?! This place really is like being on another planet- its unreal. Does looking at camels in the desert ever get old? Yeah, I didn’t think so either. 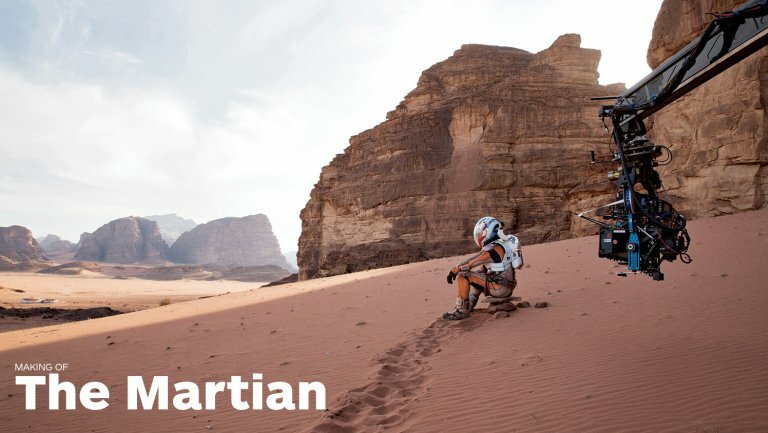 We also made a quick stop here, where our guide pointed out, a scene from “The Martian” was filmed. We took some time to let each of the kids recreate this picture from the movie, below. Ha! Fun memory for all of us. Across from us was another place we recognized from the movie. This valley below. Feeling like we spent actual time on the set as well as Mars today. Our next stop was in this little area between the rocks where the famous petroglyphs are. These drawings of antelopes and humans date back to the 8th century BC and are watched over carefully by the several hundred Bedouin that still live and thrive in the Wadi Rum. This place! Our guide last year said he knows this vast desert like the back of his hand. It’s his home and he knows where all of the rooms are. You totally get this feeling when a local shows you around because there are no maps, no roads, only places that they’ve seen a million times because they live here. We stopped at this natural rock arch that was surrounded by tourists taking pictures of it from below (safely on the ground). We decided we needed another vantage point and scaled the sketchy rock path up to the top so we could walk across the arch together. We all made it up and then Brian hurried back down to catch us in action. Such an awesome memory of being high above and looking all around- and what made it more fun is that all of the tourists below, once they saw “little” girls braving the arch, decided they might as well give it a shot. So proud of these girls that aren’t afraid of a little adrenaline! Made it to the rock shaped like a mushroom and got to pet some free-roaming camels just across the way. We also went to a canyon where we could shout whatever we wanted and hear it echo a million times off of the rock formations. We made it back home after our 3+ hour tour through the Wadi Rum, not much worse for the wear for being bounced around in the cold for hours :). 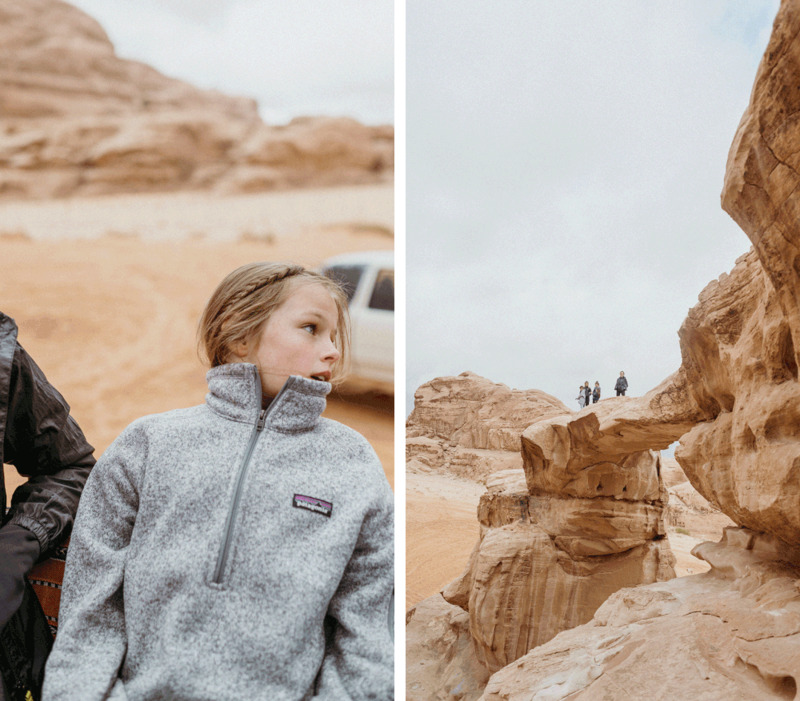 We packed up our stuff and headed to our next stop: PETRA!! Petra was the capital of the ancient Nabatean kingdom in as early as the 4th century BC. Their descendants still live here as bedouins and you can see their tents on the ridges high above the ancient buildings. They are the only people allowed to settle and sell wares inside of Petra so you’ll hear and see a lot of that going on- from donkey and camel rides to jewelry, food, decor and all other kinds of souvenirs. When you first arrive at Petra and buy a ticket to enter, you’ll walk for about 30 minutes through peaceful and narrow canyons. It’s a sort of get-ready-for-what-you-will-see-soon sort of atmosphere and then all of a sudden, the majestic Treasury emerges. It is truly wonderful, as in one of the wonders of the world…and rightly so. The intricate details that have been carved out of red rock throughout Petra are unbelievable in their design, detail and scope. After spending time exploring near the start of Petra, we walked further in to the theater, ancient tombs, temples and homes before deciding to hire donkeys for each of us to get us to the Monastery quickly. We knew we had to be back in a few hours to catch our flight from Eilat, so we had to save time where we could and this was worth it! Riding the donkeys up the steep and slippery steps for about 30 minutes was equal parts nerve-wracking and thrilling. Those donkeys ruled the path! They did not wait for anyone to step aside or go faster- they would just mow right on through whatever was standing in their way. Yes, thats the nerve-wracking part! The Monastery is different, but no less impressive than the Treasury. Not as many people venture this far in to Petra (its about a 2 hour hike from the start), which makes the sight of it that much more valuable. We got off our donkeys and walked for the last few minutes up to it. The girls LOVED exploring all of the nooks and crannies and talking about what they thought each room was used for as well as looking for interesting shapes in the colorful walls. Overlooking the Monastery and the infamous port-a-potty (story below). I hope these girls remember what it felt like to be in this magical place and the effort that you take to see something as special and unique as this. And, then, how that effort is totally worth it. Backing up a bit to tell a story I want to remember: Once we reached the Monastery, the girls left to explore further with Brian and I sat down on a bench by a little cafe. I felt the beginnings of a migraine and wanted to relax and take it easy. I’m glad I had already seen the Monastery because I didn’t get much out of it today as my migraine got worse and worse. I had stupidly forgotten not to bring any pain medicine with me and didn’t have my wallet either (not that you could buy pain meds up there, or even a Diet Coke to wash it down with!). I listened to the tourists all around me for anyone that spoke English and who then, I would have explained my headache and asked if they had any medicine. I was desperate and my pain had reached head-exploding levels at this point. If not treated quickly, I get nauseous and throw up when migraines hit and I began to feel that coming on as well. I slowly stumbled up the hill and around the back of the cafe to the only toilet around, a port-a-potty. It was being cared for by a bedouin woman who was charging 1 Jordanian Dinar for entry (equal to 2 USD). I had nothing and so I sat down in the sand by the toilet and I could feel the color draining from my face and the sweat pouring as the urge to vomit was coming on strong. I proceeded to throw up all over right in front of her (poor woman!) and she, speaking zero English, sweetly handed me some toilet paper. I felt a little better after that and returned to my bench, where a few minutes later, Brian and the girls returned. We started the hike out and about halfway down, we again hired the donkeys to take us all the way to the Treasury (no way I would have made it on my own because my energy was totally zapped). They dropped us off and we walked the rest of the way out- about 45 minutes- to the ticket gate, where I lost my stomach all over again. I got some medicine at a local pharmacy and passed out for the first part of the ride back to Aqaba, where we would return our car and taxi to Eilat for our flight home. Brian had to race back to make our flight on time and we literally made it through our car return, passport control in Jordan, then entry to Israel (no quick feat) and then to the airport in the nick of time. It was sort of amazing the way the timing worked out so perfectly. Despite a rough time for me in Petra, the trip to Jordan was nothing short of amazing. We would all highly recommend coming here!